There was to be no dinner on the second or subsequent nights. This fact was unknown to us on the Sunday evening, the day of our arrival, when we entered the dining room as the clock from the nearby church struck eight. Just as the Signora Bertolini had promised rooms with a view, so the Hotel Blaha Lujza had enticed us with half board. But it was not to be. The information being given out, somewhat ingenuously we thought, as the soup plates were cleared and the fish placed before us. However, breakfast would, we were assured, as though not to be denied a prize altogether, be served each day at the advertised times. 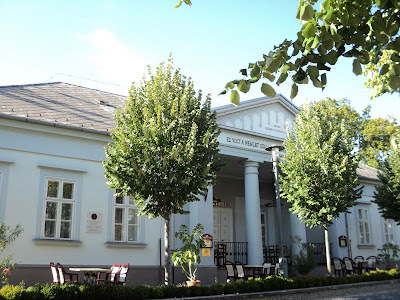 The Hotel Blaha Lujza, originally home to the eponymous nineteenth century singer, fondly referred to as the Nation's Nightingale, stands close to the shores of Lake Balaton at the heart of the picturesque Balatonfured. Once reserved for the Party faithful, and elite, this lakeside resort has, in recent years, transformed itself into the most fashionable and delightful of watering places. A broad promenade, shaded by plane trees, their peeling bark revealing deep pools of clotted cream, runs alongside the languid water where sailing craft slip silently among the gliding swans. Across the lake the sun glints on the Abbey of Tihany from where, in earlier times, as an Empire collapsed, the last King of Hungary sought refuge and then stole away from crown and country. Across from the main square lies the hospital. Each morning, we observe a motley selection of patients, slipper clad, dressing gowns dangerously slipping, tired nakedness exposed, others in assorted day wear, gravel crunching underfoot, all shuffling towards the central fountain where the healing waters, properties unknown, continuously gush their energising goodness. Some, greedy for more, fill plastic bottles. Liquid hope. And it is there that we spot our companions from the breakfast table. 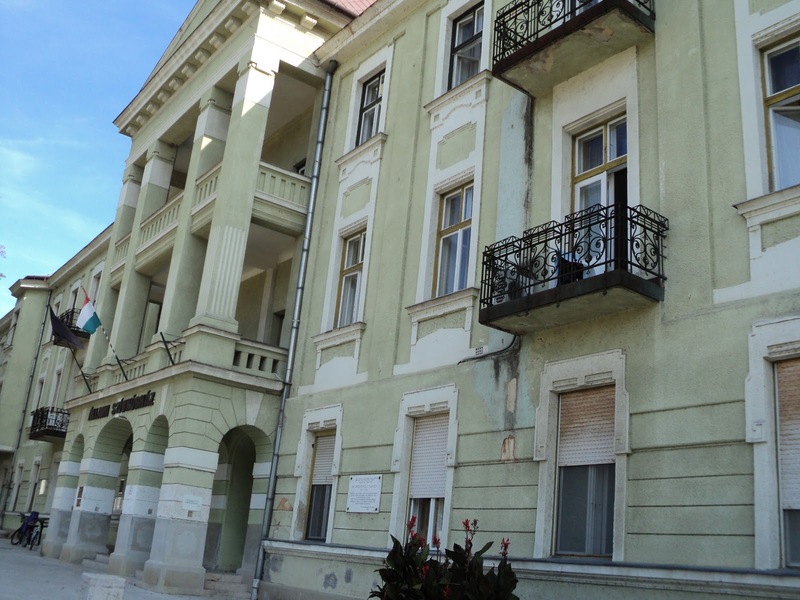 They too are guests at the Blaha Lujza, but we suspect occupy a ground floor room for age and infirmity surely prevent access to the upper floors. A mother and daughter. Two flightless birds. Both are of an age but the daughter, clothed in rookish black, maintains a gaunt, determined presence. Unsmiling, her glance conveys a dislike of foreigners. Beside her, the sparrow must be fed. Although the day is already hot, fans whir overhead, the mother draws comfort from cardigan and shawl. A woollen skirt sweeps the floor, hiding for the moment tightly buttoned black boots. Later they will progress, at mourners' pace, towards the square. But for now breakfast is, as promised, served. We watch, intrigued, as morsels of bread [how else to describe?] are slowly transferred from plate, to finger, to mouth. Each successful bite is rewarded as the daughter, half rising from her seat, leans across the table and pecks her mother on the cheek. The process is repeated. The silence is maintained. So, just as swallows take flight, the last days of summer fragment into memory and autumn mists creep with stealth along the now deserted shore. Above the town the Budapest train approaches Platform V.
Wonderful photos, very peace- and restful. Have a nice day! Thank you. It is a most attractive town and well worth visiting. Oh, your writing has somehow remind me of the decadent atmosphere of Death in Venice, with all that end of summer feeling as if it were the end of an era too, all the delicate observation of little things that will not be forever anyway. Did you try the waters ? The fountain looks lovely but I am not sure I would try the water. Such lyrical writing, the Hungarian equivalent of "A Room With a View". I love the description of the elderly daughter gently kissing her mother's cheek as breakfast progresses. An area of elegance and wide open spaces, perfect for afternoon walks. I was quite swept away by the pathos in your piece today. In fact, echoes of Mahler involuntarily played-out in my head as I saw the daughter, already in mourning, tend her frail mother. The contrast between the promenade along the shores of the beautiful lake and the short shuffle from the hospital to the healing spring is so sad. Although I do not consider myself to be a good writer, I always appreciate reading a well written post such as this. You have such a good way of drawing the reader in. And with the addition of wonderful pictures, I really felt I was sitting with you at breakfast soaking up the surroundings. I hope you enjoy the remaining late summer days in Budapest. Really lovely pictures, J & L. Can almost smell the huge lake itself - and certainly makes me want to be there. Thanks. I love the idea of enjoying a breakfast before the hotel portico. It looks like such a beautiful spot to take in the sunshine. Lovely photos of what looks to be a most beautiful place. Enjoy what is left of summer. Time seems to go by so quickly, doesn't it?! We are thrilled to think that you have found the post reminiscent of 'Death in Venice' since we take that as a huge compliment. In the hotel and in Balatonfured itself there was an atmosphere of 'staying on' long after the high summer tourists had left. We found it absolutely charming. We did try the waters, rather tasting of sulphur!! Drinking it on a daily basis would have been challenging, bathing in it [which we did not do]might be the safest option!! Dear Jane & Lance - what an evocative and beautifully written piece of writing, conveying those feelings one has as the summer passes on. Thank you, Susan, for your most kind and generous comment. Balatonfured is indeed the perfect place for long gentle strolls. The promenade stretches all along the lake front, shaded by an avenue of Plane trees. 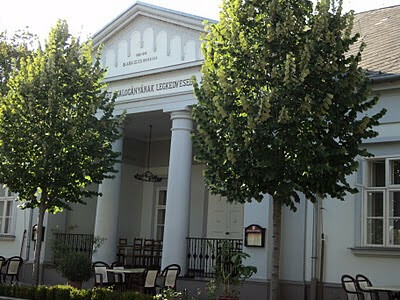 And, there is the absolutely wonderful Karolina café for enjoying a coffee and watching the world walk by. How absolutely delightful and old-world, all of it. The sedate pace of a mid-european watering place, out of date and away from the centre of what is now the fashion, visitors who live in a more elegant, by-gone age, and know nothing of the race most of us are engaged in daily. Your description conjures up spas of old, places to take the waters, like Baden-Baden, or Tunbridge Wells. To travel by train is another luxury almost lost to the modern world. The only thing I find slightly jarring is the fact that you were deprived of dinner. To my mind there is nothing more delicious than carefully preparing and dressing for elegant, relaxed and time-consuming dining, and lingering over the final drinks once the plates have been cleared. This almost ceremonial event is such a desirable end to a day's sightseeing activities. Yes, Mahler would have provided the perfect accompaniment to the breakfast scene and the screenplay could have been written by Chekhov. How very kind of you to say this. We wanted to give an impression of the rather surreal nature of the breakfast scene which really was like something one might read about. Like the others, I admire your descriptions giving this such a wonderful sense of place. You are always so generous with your comments, Abby, for which many thanks. We are rather having an Indian Summer here in Budapest which seems to be shared across Europe at the moment. Mornings and evenings are chillier but we have yet to don tights or socks!! Lake Balaton is the largest lake in Europe so we are told and, on misty days, one cannot see to the other side. Hence, it is very much regarded as the Hungarian seaside and we love it! What good and evocative observers you are, and I'm delighted to see you running true to your stately form in treating the lack of a dinner or two as the slings and arrow of outrageous fortune rather than taking the more pedestrian approach of a gripe on tripadvisor. Long may you travel. For us one of the great joys of summer is to have breakfast outside. In Budapest we often take it on our walkway whilst in Brighton we are fortunate to have a garden belonging to the square in which we live. But now, alas, the mornings are beginning to have an autumnal nip in the air. Thank you. That is most kind. September is, for us, one of the loveliest months of the year when all of the heat, literal and metaphorical, of summer is over and one moves into calmer days. You are so right, for Balatonfured really does have the feel of some rather forgotten spa town which somewhat appeals to us. Perhaps this is emphasised by the presence of the hospital which dominates the main square. Yes, the absence of dinner in the hotel was something of a disappointment particularly as on the Sunday night it had been rather good. However, we did subsequently find a restaurant overlooking the lake where it was fun to watch as the light faded and darkness grew. Yes, the 'dinnerless' nights, at least in the hotel, were a bit of a disappointment but one which was overcome by discovering some rather nice restaurants in the town. The Abbey of Tihany we visited some years ago and found it to be most interesting with, in addition to the church and monastery, a small museum. Its situation is, of course, lovely. Beautiful writing and imagery, thank you. I've had a grotty, bad day and reading this has just calmed me down and made me smile so thank you. You write so beautifully. Better day tomorrow! Annie x. It is most kind of you to say. It is never easy with words to convey an accurate impression of both people and place. But, at the time, we dare not take pictures of the mother and daughter!! As you say, let us rise above such petty concerns to focus on the whole, complete picture. Which in our case was where are we going to get a decent dinner?!! We are so sorry that you are having, or have had, a rather bad time and do so hope that tomorrow, and the rest of the week, will be full of joy and happiness. Your kind comment here is so very much appreciated. Thank you. How wonderful to relate in years to come how you once 'took' the waters at Bardejo. We should love to be able to say it. Perhaps one could tour Europe, visiting every spa town and comparing the beneficial effects of the waters?! Were you just a bit worried that you might have been under observation in Balatonfured, and destined to appear as the gentle, interested, but ever so slightly other-worldly English couple, about to be drawn into the action of a 'factional' novel of unbelievable emotional power, which will become an important text of a new socialist revolution in Hungary. At the centre of the novel, amid the fading charms of the surreal Hotel Blaha Lujza, sits Alida Petofi, descendant of the famous Sandor, with her fading bird-like mother, secretly preparing to launch the new Hungarian Revolution. I was there, lulled into a long forgotten past, or so it seems. This is so beautifully written and I found it so easy to visualise each of you descriptive images. Have you been published (other than florally)? It would be on the top of my reading list. A wonderfully warm summer's close to you. What a wonderful, beautifully written and very clever comment. And the use of the word 'clever' is in no way intended to patronise. We are totally entranced with what you write here and seriously wonder if, in your moments of boredom, you should turn to fictional writing, your skills in which are so much in evidence here as well as in your recent prose poem?! We think, Dianne, that you are far too generous here but so much appreciate what you have to say. Alas, our 'floral' contributions are the only ones to have actually rolled off the printing presses. Happy early autumn to you too with, we understand, wonderful weather this week. Wonderfully descriptive, as ever, it was like I was sitting on your shoulder. How amazing that the patients come out to the fountain. It came as something of a surprise to us too to see hospital patients wandering around the square. Some, possibly those who are thought to be fitter, make it as far as the lakeside. I have nothing clever or relevant to say. I just enjoyed a nice read with nice photos. But wait, I did check the lake where you were staying when you mentioned your brief time away. It is huge. It is always good to hear from you and we are pleased that you enjoyed the post. Yes, Lake Balaton is reputed to be the largest inland lake in Europe and is very much seen as the 'sea' for landlocked Hungary. Dear Jane and Lance, I read your posts with great interest, always! Your turn of phrase, expression and vast knowledge amazes me. Not uneducated (I have a Masters degree), I always feel so bloody 'ocker' reading your beautifully scripted offerings! I am generally ignorant of the historical aspects of your travel information which always intruiges and humbles me. Mostly, I feel ill-equiped to respond to your enlightening commentary and feel incredibly honoured when you leave comments on my very simple blog. Thank you for sharing your world with me. Kalimera to the both of you!Goodmorning in greek.What a lovely place so calming.I love your description of everything you see,makes for just a wonderful post.Hugs to the both of you,have a lovely day! If we had a quarter of your flair and design skills, Kerrie-Lee, we should think of ourselves as richly endowed. 'Eternal Icons' is for us a design blog of the highest possible quality, particularly in terms of inspirational ideas. That said, what you write here is most kind and generous and greatly appreciated. Thank you. How we love the International Greeting. Jó napot kivánok, as we say in Hungary!! It is, as we are sure that you agree, such fun to people watch and observe them in their everyday lives. Thank you so much for these very kind words, Diane. We do hope that some of this glorious September weather is reaching your part of France. Such an elegantly written piece, the photographs - tranquil and pastel coloured in the slowly-fading light compliment it beautifully. A sad image, the hospital patients' scene, yet somehow amusing to me;"dressing gowns dangerously slipping" appeals to my immature comedy tastes! I enjoy your writing style very much, I'm always left wanting more. I am waiting for the announcement that you are writing a book--a collection of memoirs? A collection from the blog? Any subject will do. Sigh--you give me something to strive towards. An intriguing place and experience... only enhanced by the mother and daughter duo! This is extraordinary generous of you, Lucy. Thank you so much. We have to admit that we did find the sight of the hospital patients faintly bizarre and found ourselves laughing [we trust not at them but rather at the whole situation] on several occasions. But the traffic free square in which they wander is a wonderful place to sit and people [or patient!] watch. Heather, this is pure flattery! You are the one who should be writing the book, and how wonderful it would be with Remi's superb images as illustration to your own delightful text. Believe us, the mother and daughter were quite something and certainly not in any way belonging to the present time. They intrigued us throughout our entire stay. I just finished reading (or re-reading of course) A Room With A View and even without your reference, I think your post would have put me in mind of it. Such vivid and subtle descriptions! Truly it seemed you were in another time. 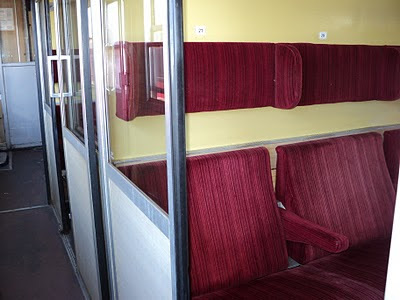 And those wonderful crimson train seats! Though the compartment looks modern, the seats recall the past. What a beautifully written piece. It's literature cloaked in memoir. Loved the ending, despite not wanting this story to end. Ye, it was all terribly Forster where the hotel was concerned and one expected at any moment a Miss Lavish figure to accost us. As it was the mother and daughter more than made up for it. The trains, in fact, are not at all modern and date from the 1960s and 1970s with all signs in Hungarian and Russian!! But they really do run on time and are terribly reliable if not exceedingly hot in summer as there is absolutely no air conditioning - just the windows to open or close. It all was a wonderful experience, made even more so by the mother and daughter about whom, as you may imagine, we speculated greatly and at length. 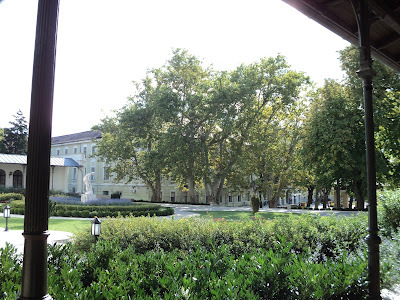 Looking back over the whole of our break at Balatonfured there was something slightly unreal about it all, especially the Hotel Blaha Lujza which could so easily have come from the pages of a novel. This is very generous of you but, we assure you, not true at all!! However, we are so pleased that you found the post of interest and thank you for your comment. This post was so well written! You not only described the surroundings, but also told a touching story of the mother and daughter in an poetic, beautiful narrative. It was such a pleasure to read this; I am in awe! I choose this as The Best of the Hattats, which in itself is quite a feat. Very beautiful! like always your writing is mesmerizing. I could visualize every word you have written, who needs the pictures. My dear Jane and Lance, your observations are penetratingly beautiful and naturalistic. It transported me to the other world. I thought this kind of hotel could only exist in Anita Brookner's world of Hotel Du Lac. But it seems so reassuring to know that such places still exist in the real world. I wish Anita Brookner [my favourite English writer] was there with you at this hotel, she would revel in it with her antiquely elegant prose. We are blushing, Arleen, with your most kind words. Somehow, being at the hotel as summer turned to autumn, as tourists were replaced by local residents and as the numbers of casual sailors dwindled and one became more aware of hospital patients, the mood was mellow and we wished to capture it in words. A moment in time to be recalled with some sadness but also great fondness at leisure. We are so pleased that you have enjoyed the post. Alas, we have little skill with the camera, and so we are overjoyed that the words are sufficient for you! Something about this sentence is very appealing, for a time. As you might expect, Anita Brookner is a favourite of ours too. And, you are so right, it could have taken place in the 'Hotel du Lac', indeed it all felt like a chapter from the novel as we were living it. Lake Balaton is, we feel, strikingly beautiful. Only sailing boats are allowed and they glide past so elegantly, setting the pace for a town that is, in so many ways, firmly rooted in its Victorian heyday. As you can tell, we love it!!! We were captivated by the tale of King and Queen secreted in the cellars of the Abbey at Tihany........hopeless romantics, we know!! Lake Balaton is indeed wonderful.....but, far from cool as it happens. 21C to be exact when we were there!! Yes, Linda, something of the Agatha Christie about it, that is for sure. The lack of dinner at the hotel did mean that we were encouraged out and we did find some excellent places to eat. On our last night we had the most marvellous table with a direct view onto Lake Balaton. Magical! Beautifully written. I've been hooked and want to know more! What happened to mother and daughter? Well, we do have to say that it is rather Hungarian to have something advertised and then, without word of explanation, it does not happen. It would appear that dinner was served on Friday, Saturday and Sunday but not on other days for reasons unknown. Such a pity as the dinner we did have [Salmon with a lemon sauce, herbed potatoes and vegetables] was delicious. Mother was clearly a patient at the hospital which specialises in heart problems and it appeared to us as if this was a regular stay in order to take advantage of the hospital treatments. Mother did have enough pills to sink the Titanic but was a wiry old bird. We thought she might well live to be a hundred!! Such an enjoyable post! I can imagine the two of you sitting in the breakfast room, or outside near the lake, looking at the people that pass by. It's one of my favourite occupations too. I see you enjoy Forster. It's been ages since I read his books, but I liked them very much. Should we ever have the great good fortune, Linda, to all meet up in the real world then we must share a large box of F and M champagne truffles!! Do we sound as if we are the sort of people to miss out on dinner? One Christmas Eve many years ago in a Budapest hotel, for reasons too boring to go into here, our dinner consisted of a few marzipan fruits and NOTHING else. We have learnt many survival strategies following that experience!! Yes, Forster is a favourite and there are many occasions when we think our lives have really taken on a 'Forsterian' influence. 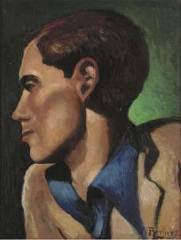 His novels show such an acute observation of human character and we too love imagining what personalities lie behind various people whom we meet. We hope that you are having a relaxing evening too. Felt like I was right there... that's what your writing evokes, felt real. I love watching people too, and sometimes clicking pictures of them... sounds like an eventful holiday, anyway you got something out of it, you know what not to visit now. We are so pleased that you enjoyed reading the post.If only we had your photography skills we should love to be taking pictures of everything too. However, in this case we should have been too afraid to take a picture of mother and daughter, but perhaps a spy camera next time.....!! I loved your description of the mother and daughter at breakfast--reads like something out of Henry James. How well you convey the mood as well as the action. Blaha is a name to conjure with...kind of like a Hungarian Lillian Russell. I can imagine formal first nights with monocled counts and corseted ladies wearing diamonds. We are delighted that you have enjoyed reading. Thank you so much for your most kind and generous comment, quite undeserved. As Hungarians give surnames first, the Nation's Nightingale would have been known as Lujza Blaha to us and was Hungary's most famous singer and actress. Yes, we too can well imagine the monocled counts with wonderfully oiled moustaches!!! What a beautiful and charming place. I've never seen such a picturesque hospital before. Just lovely. Such a beautiful and tender picture of our never ending attempts to impede the inevitable. Watch a touching witness! I hope you didn't go Hungary! You have reminded me of this little gem from Dame Barbara Carthorse. Her rapping sounds so elegant and sophisticated. What exquisite wording! I found myself quite carried away in the moment, as if somehow transported to a world of 19th century novels where Colette chatted with Henry James over your very breakfast table of morsels of bread. What an unique post, Jane and Lance. I enjoyed your description of breakfast. All my friends think that I dine out because I'm helpless in a kitchen, but the truth is that I love to get my daily fill of people-watching. So many stories to see unfold and blanks to fill in! I suppose all travelers have a Hotel Blaha Lujza moment now and then. I have a memory of angry waiters throwing crockery in Iran! At least the unexpected is always great materiel for blog posts! The location is stunning and I am left with your poignant line, "liquid hope" which is truly beautiful. So now I have another magical destination to add to my list... how utterly enchanting. I agree with Demi and V/Jane - I was drawn in immediately. Very Chekhov indeed! It is certainly possible that we may have watched the mother and daughter a little too closely. We hope now that we did not actually stare! How fascinating that you have thermal springs near to you where people come to take the waters. It is clearly not simply a European practice. Yes, the hospital which, we think, dates from the nineteenth century, occupies one complete side of the square. Sadly, on the lakeside it has had ugly additions built during the Communist period and which spoil that facade. It all, unfortunately, requires restoration. Age does, we fear, creep up on us all and observing both the mother and daughter and the hospital patients one comes to realise how inevitable it all is! We loved the pun but have ADORED Dame Barbara Cartland's rendering of 'A Nightingale Sang'. How very clever of you to have found it [we listened to it all through] and to have made the link. And the image, all that pink and that rather nasty little dog looking exactly like her hair. Thank you so much. You are, we think, far too kind and the comparisons far too generous but greatly appreciated. It was all rather fun and intriguing and, we feel, a unique experience. Thank you so much. One of the great joys of the blogosphere is that it enables one to 'travel' to far off destinations and gain all manner of experiences without any of the hassle of a journey. It is, as you say here, Mark, the filling in of the blanks which makes people watching wherever so very fascinating. And restaurants always provide a very good source of interest, in addition to the possibility of good food as well! Your tales from Iran would, we are sure, make for most interesting reading. We trust that the plate throwing, in anger, was not directed at you personally. All very alarming. The Hotel Blaha Lujza is, we are sure, in some form or another to be found throughout the world. Lake Balaton is a most attractive place to visit and many of the towns around it, particularly on the north side, are very pretty indeed. Tihany, where the abbey is, is wonderfully situated but has, in recent years, become very popular and is now somewhat spoilt, at least during the summer months, by tourism. Welcome! We are so pleased that you enjoyed the post and will very much hope to 'see' you again. Dear Jane & Lance...We would never have know of this mother and daughter's sweet and eccentric doings but for you, nor this beautiful and charming spot so far away, thank you for taking us their so clearly, it's as if I was there. Seems there are many places with restorative waters folks take hoping for a better, longer or healthier life. When we lived near Hot Springs Arkansas we just to get spring water there and take it home in jugs. Here in Florida we hope to get to St. Augustine which supposedly has the fountain of youth named by Ponce de Leon. To see that many swans in one place how wonderful I have always loved them. I can just imagine how lovely it was to walk along the shore. I like the pace of this story, almost like the gentle waves lapping at the shore. Thank you, Jessica, for your kind comment. We are pleased that you 'travelled' with us! It is many years ago now that we drank the waters of Bath but we recall a similar taste Not absolutely unpleasant but strange! We are of a mind, like you, that it is the idea of a cure which makes the waters potent. However, having said that, many people do seem to have benefitted, particularly after bathing in them if they have rheumatoid problems. So, perhaps there is some magical mineral in them after all?!! Well, a fountain of youth! We should certainly be prepared to give that a try, Linda. There are many thermal springs in Budapest and across Hungary and how interesting to know of those in Arkansas. It is certainly a very popular activity here to bathe in them and, as you may have seen in many pictures of the baths, play chess whilst soaking! The Swans are wonderfully elegant and yes, there are many hundreds of them on the lake. Hope you are having a lovely day Jane and Lance! Very atmospheric piece. You obviously, like me, home in on the oddities that you see around you! Thank you so much for your kind and generous comment. We have tried to recreate the atmosphere of the place and the people and are so pleased that others have found it of interest. There is always something bittersweet about summer gently fading into autumn and that was our mood at the time which we wished to share. As we so often say, we are hopeless photographers and so we are pleased when any image turns out which vaguely resembles what we were looking at!!! Yes, we suspect that we may well be attracted to similar things when it comes to people watching!! We are so pleased that you enjoyed reading. We have heard of the Roma support organisation which is heavily involved in work on the Hungarian/Romanian border but, sadly, do not know of any workers personally. A memorable getaway and the image of the swans flows beautiful with the story of Mamma & Daughter. The cygnet likely remains in the nest and has assumed the role of feeding the mute mother swan. This must be put to music. Thank you again for a beautiful journey. Oh how we love your imagery of mother and daughter as swan and cygnet. Delightful. 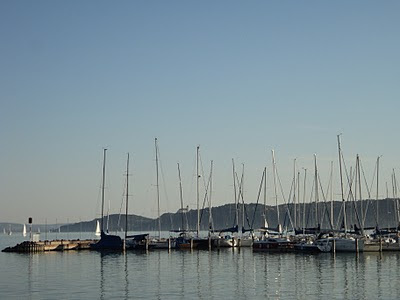 We are certain that the music of Mahler,still in our minds from 'Death in Venice', would surely make the most wonderful soundtrack to this screenplay on the shores of Lake Balaton. We hope that you are well and enjoying the late summer sunshine as we continue to do in Budapest. I have no words for the beautiful of this post---your eyes see so much, and your own words are stunning. You are so kind, thank you. We know from your own blog what an acute observer of life in all its facets you are, so your words mean a great deal. What a kindness from daughter to mother. And, since she is surely unmarried and childless, how sad that, probably, no one will love her like that when she's old and alone. Beautifully written and evocative as this post is, it has made me feel quite melancholy. It looks like a very relaxing place indeed. I like the idea that the healing water flows form the fountain across the street from the hospital - very convenient to say the least. Beautifully written. Charming, but with a sense of melancholy that lingers. What a story! what a tale! ; wonderfully written, evocative surreal. I went once to the Royal Albion, in Brighton, for Sunday lunch and witnessed many similar old birds pecking at lunch. I love the quirkiness of the hotel dining and the liquid hope in a plastic bottle was heartbreakingly sad. Brilliant; thanks for sharing. I enjoyed reading this so much. It kind of reminded (in a round about way)me of some of the characters in a short story by Agatha Christie in "The Labours of Hercules" . You will have to read as I won't give anything away. Ah, there it is...Lake Balaton! How wonderful it is to see a morsel of your stay there! A beautiful place. I so agree with the friends who have commented, your brilliant post reads like a delicious literary piece! Bravo...And thank you for the photo of the train! Brings back memories..
What you say is so very true. Who,indeed, will look after the daughter in years to come? But, we felt, it could be one of those situations where the mother outlives everyone - a wiry bird and game! We are sorry it made you feel a little sad. Have a really lovely weekend. 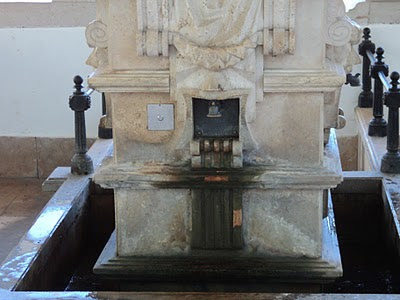 Certainly the hospital is well situated for the waters, the fountain of which is the focal point of the square. But that apart, the square is a very pleasant meeting place with plenty of benches to sit upon. Possibly there is always going to be something slightly sad about anywhere whose principal purpose, such as a hospital, is to take care of the sick. That said, Balatonfured is a most attractive place to visit. Oh yes, hotel dining, always an experience and something which rather appeals to us, possibly because as one enters the dining room one is involving oneself in a slightly surreal, artificial world. When in Brighton we are often tempted to have Sunday lunch at the Albion or the Grand. Perhaps we really should give it a try! We are most intrigued. The Agatha Christie short story which you mention here is something which, most definitely, we shall seek out on our next trip to the UK. Thank you! 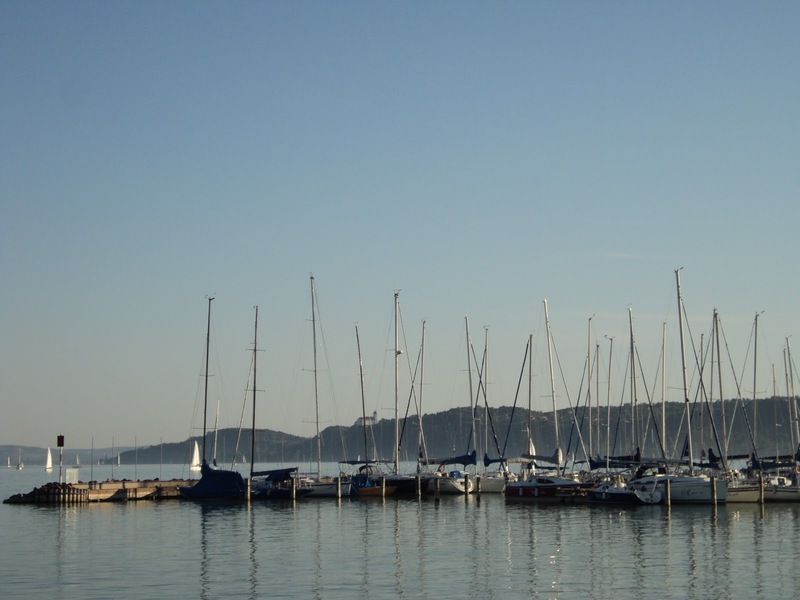 Lake Balaton really is a wonderful stretch of water and many of the towns which surround it, such as Balatonfured, have an old world charm which is most intriguing. And for a little ol' Aussie like me, while this is a fascinating glimpse into the concept of 'summer' as experienced on the other side of the world, it highlights once again the uniqueness of life downunder! Beautiful photos and descriptions. I love the poetry of the story of mother and daughter. Well at least the half board did not mean a bed for one night only!! So good that up and over or down and under, variety is the spice of life!! Thank you for your most kind and generous comment. We are so pleased that you enjoyed reading!! Oh my. You've made it as if I can feel the pulse of this place. Your words pulled at my heartstrings. Rachel sent me here, and I am so glad she did. We are so pleased that you enjoyed the post. Thank you so much for visiting, we have had great fun finding you and we do so hope that we shall see you here again. Oh yes, Jane and Lance, this is on my "must visit" list when next in Hungary; you've made it sound winsome. I loved Piestany and Lake Balatan and surrounds reminds me of that spaaaah visit...something to knit body and soul back together, to renew, refresh and give sustenance to face anew the rigors of the day. And, dear Sandra, on your next visit to Hungary, which we do hope will not be too far into the distant future, we shall all go together to Balatonfured, to take the waters or not, and what great fun we shall all have. And, hopefully, someone will write about us!! Your posts are always like a little study in literature and history...always making me do a bit of research. Google makes that easy these days. The Abbey of Tihany looks beautiful and found photos that showed the red roof tops of the Abbey and surrounding structures. Looks like a beautiful place to spend a summer. Love the photo of your train compartment...train travel is my absolute favorite. Hope you are having a lovely day. The Abbey of Tihany, as you have seen for yourself, is certainly a place of great interest and was, in fact, where the last King of Hungary, together with his wife, Queen Zita, spent their final night before going into exile. A monastery and museum are attached and so there is much to see. Like you, we love to travel by train. Here most of the trains are old, dating from the Communist times with signs in Russian, but they do run to time and do go everywhere. It's so interesting to travel with you to the sorts of places that attract your attention, and to hear about the stories and moments from your life that you enjoyed. Thank you so much, Olga, for your kindness. We too love to travel with you. It is such fun we always think to see the world through the fresh eyes of others. Thankyou for such an enjoyable and beautifully written post Jane and Lance - like an enticing extract from a novel. Wonderful photos and it looks a beautiful if somewhat melancholy place to stay due to its proximity to the hospital. Thankyou for your comment - the visit to the Decorative Fair was a first for me but certainly won't be the last - so many beautiful things. Thank you for your most kind comment, Gill, we are touched by your words. We did have a wonderful time. The weather was amazingly good and we could read under the shade of trees and just watch the world go by. The hospital is a marvellous building and is really not the least bit sad. The Decorative Fair is such a treat is it not? We have been several times and it is good to see the new decorating trends and ideas. We look forward to reading about your visit. An interesting post. A relative called Zoltan used to send us many postcards of Lake Balaton - usually the postcards were very similar so it is interesting to see some of the hinterland, as it were. I love the colour scheme of the train. It reminds me of some kind of boiled sweet! What a beautiful piece of writing this is! I love particularly your exquisite portrait of the "mother and daughter. Two flightless birds." What a lovely lakeside resort! You must have relaxed and unwind yourselves, Jane and Lance. I’d love to see so many swans cluster together in person. The hospital doesn’t look like a hospital - very nice and elegant architecture pleasing to eyes. At your final days of vacation, summer seems to have given way to autumn. Enjoy your autumn. Postcards from someone named Zoltan do have a very genuine Hungarian ring to them!! Hungarians are, understandably, very proud of Lake Balaton which is, of course, a huge asset in a landlocked country. We love the idea of the train seats reminding you of boiled sweets - we had not thought of it but they do! Thank you so much, Susan. They did so much make us think of birds, particularly the small, wiry mother who pecked at her food rather in the manner of a sparrow. The swans are in fact lovely, the ducks too, and all very tame as they are used to people bringing bread to the waterside and feeding them. Young children love it, as you may imagine. The hospital, architecturally, is very fine with, on the lake side, many balconies and loggias opening from the rooms. Sadly the whole building is in need of total restoration to preserve it as it once was. Thanks to the both of you for visiting,have a lovely weekend! How magnificent of a post to see such beauty and art...it has soothed me to come to blogland where I can visit people from all over the world who are sharing their joys, sorrows, passions and hopes. THANK YOU for visiting me and your kind comments give me the strength to know that even in a frustrating moment, we can create a little beauty. Isn't that Eiffel Tower photo fabulous? Hoping that you too are enjoying a relaxing time! Beauty and Art can often, we think, be seen in so many unexpected places. It is as you say, Anita, so good to be able to share such things right across the world through the wonders of technology. Hoping that you are enjoying a relaxing weekend! Lovely setting, rich, evocative writing and... no dinner? Oh my. Will have the image of the mother and daughter in my thoughts all day and will have a hearty breakfast in their honor. Oh, all right, I'd have one anyway. Can't wait to see what new adventures autumn brings you. Dear Jane and Lance, i don't think you are capable of writing a dull post. This one seems somewhat sombre and even a little bit dark due to your breakfast companions. I first thought of the characters from a Henry James novel, but the description soon reminded me of Lorca's depiction of mothers and daughters. I feel like i was sitting there with you, observing the pair in silence while picking the crumbs from my plate too. You really do know how to transport us to a different world. Thank you. Thank you so much for your kind comment. Yes, so important to keep your strength up with a decent breakfast. At least the hotel did provide that!! Oh yes, autumn adventures and what delights, we wonder, are in store with you as the festive season approaches?!!! Thank you for your most generous words. You are so very kind. It was one of those occasions where one almost feels that one is in a novel oneself, playing out a role that someone else has written. Dark, we agree, and surreal even! We are intrigued by your mentioning of Lorca and,as far as we are concerned, any comparison with him is a great compliment indeed!! Your description reminded me of Lorca's play "The House of Bernarda Alba". The mother in the play has a complete control over her 5 daughters, and the scene you wrote made me think of the play and their relationship. A very talented someone, for sure. I do hope you got fed well somewhere and that you also got a kiss after each bite! And after much scrolling, I have reached the part where one can leave a comment. There you go 'mouse', we have arrived. Now obviously, much has been said about this wonderfully narrated posting with the superb accompanying photos. Which reminds me, do you take turns writing different posts? Or, have you taken turns within the posting? Or perhaps it's whoever feels like writing. Or maybe there's no set pattern. Of course, in my case, I do take a break from writing and allow Penny the Jack Russell dog and modest internet star, take over and yes, it's true, she gets a lot more comments on my site when she does a posting. But even she has never had as many comments as you two fine folks get. I wont mention just how many comments you two fine folks get, to her. We wouldn't want to upset an adorable little Jack Russell. Now would we? Oh my, I digress. So, to leave on a serious note, an excellent read and I might even try writing about my exciting adventures at the bus station in Stoke on Trent. Yep, that will get me more comments than I could ever have dreamed of. Do I get an award for a long, rambling, nonsensical comment? Yes? No? Maybe? "The sparrow must be fed." This is funny, or sad, both I suppose. Anyway, the place sounds like it was interesting and like it provided a nice opportunity for people watching. Thank you so much for your very kind comment. Lake Balaton is indeed a beautiful place, although we much prefer the North side of the Lake as it is generally less crowded than the South side. We are so pleased that you have 'found' us and we shall now go to seek you out! Thank you so much for taking the time and trouble to return with this detail. We do not know of 'The House of Bernarda Alba' but we shall most definitely now look it up. It sounds absolutely our kind of thing! There is no set pattern to how we write,it really is as the muse takes us.We both write individually about whatever takes our fancy and then we decide together what we shall publish when. One of us does, however, have overall editorial control, but, as to who that is, well we must leave something as a mystery!!! We love your comments, Gary, as we do your replies on your own lively and varied well written blog. Now, time for you to tell, Gary, how do you get Penny up to the keyboard?!!! Well, one of us wrote it that is for sure!!! We can report, however, that although we cannot recall a kiss after every morsel of food, an embrace in the moonlight by the Lake was something we omitted from the original post!! Yes, the mood was one of a bittersweet experience, happy or sad depending upon how one viewed it. For us, this was so reminiscent of this time of year when summer becomes autumn and we are never quite sure whether this is a time to celebrate or mourn. What a super discription of summer fading into autumn. Having breakfast outside must have made it feel, if only briefly, like summer. The hotel's portico and hospital facade certainly hark back to a grander era. Much of the architecture in Balatonfured is very attractive and does give the whole place the rather grand feeling of a 'Victorian spa' town. The days were extremely hot whilst we were there and so eating out for breakfast, lunch and dinner was the order of every day! Thank you so much for these encouraging words. We are always delighted to see you here. Blogger does, as we ourselves know only too well, play up from time to time where comments are concerned. Such beauty all around, in sights and sound from the old and the new you paint pictures with yours words that rival the image created with one of those camera machines. How creative lovely your end of summer sun has made us feel. Much love and good wishes. Thank you so much, Jason, for these really kind and generous words. They are much appreciated, as your comments always are. This lovely autumn weather continues here but for you, as we understand it, there is a return to high summer. I am so pleased to discover your blog! Your photos are fantastic and your explanations very interesting! I envy you to commute between Budapest and Brighton and I had to laugh when I read that if someone asks you what you do your reply is "do we look as if anyone would employ us?". That is great humor to me and I think next time I will to the same! I am very much appreciating your comments on my posts and I am so glad that you like it! If I could I would invite you for chestnuts and tomato sauce.... Have a wonderful day! By the way: I have put you on my blog list and enrolled as a reader. Thank you so much for your kind comment. We are thrilled to see that you have signed up as a Follower. We were so pleased to have discovered you and are so enjoying reading what you write. If only we were closer for the chestnuts and tomato sauce. We are totally hopeless in the kitchen, just another range of skills we do not have!!! Loved the swans at the edge of the lake the most, so serene. Yes, the swans are really beautiful and there are so many of them. It is very relaxing watching them glide by. As soon as we have finished typing we shall come to visit your blog. I invite you to check out my other blog 'Mom's Turf' when you do have time. Thanks again. Another journey to another fascinating and, to me, exotic, European destination! Beautiful, evocative photos--as usual :) Sorry not to have popped on sooner (I have been super busy on all fronts of late--professional, domestic and other-wise ;)). Hope you two continue to be well!! We are delighted to welcome you as a Follower and thank you. We do feel that we are most fortunate not to be working particularly as it allows time, most likely too much, to explore the Blogosphere where one 'meets' so many interesting and lively people. Elizabeth, please do not apologise for anything. For our part we are delighted to know that you are busy, particularly on a professional front - long may it continue. Here summer continues, now well into autumn, with warm, sunny days and blue skies. Strange. Thank you for sharing! I remember those trains! Yes, the train compartments were like a trip down memory lane for us too!! Your description of the mother and daughter was extraordinary. So vivid, but so original! Thank you for your kind comment. Both mother and daughter were quite extraordinary! What a delightful excursion to Lake Balaton. I find that spas always have a slightly melancholy but romantic atmosphere. I suppose the gambling is the antidote to matters concerned with health and illness. Most North Americans are unaware that visits to such spas are often paid for by the health care system in European countries. For many years I visited Baden Baden and loved it. The waters and therapies definitely make one feel better, and the beauty of the setting feeds the soul. Going through the exquisite heritage bath buildings, with their soaring halls of marble and ceramic murals, is an incredibly luxurious feeling. We have always been attracted to Spa towns for many of the reasons you give here. They seem to us to have an air of quiet gentility about them which we find alluring. Baden Baden sounds wonderful and we are sure that we should love it too. Budapest sits on a labyrinth of thermal waterways and the many ornate and less sophisticated baths across the City attract many tourists each year. Kalispera(good afternoon) to the both of you.Thanks so much for your visit,I always enjoy hearing from you. Blessings to you both!Jo hetveget? I love learning new languages,what does it mean?I wont pretend to know Hungarian lol. A beautifully written, evocative post, gorgeously illustrated. Thank you. We always enjoy our visits to your lively and spirited blog. Jó hétvégét is Hungarian for 'Happy Weekend'!! Thank you for your kind and generous comment. We are so pleased that you enjoyed reading. From the title I was expecting a stroll in Berkeley Square my dears but this was an absolutely fascinating read. How I love faded spa towns and have visited a fair few, not only in the UK but on the Continent too. I find them truly inspiring to my daydreams (as do train journeys and that carriage looks particularly inviting). Regarding Mother and Daughter, from your description I can picture them as clear as day in my imagination. People watching is something I do with relish, and they would have fascinated me. Should I have been present I would have sketched them surreptitiously! Is one able to visit the Abbey? Yes, very 'Death in Venice' and how wonderful if you had been there too to capture mother and daughter in a drawing. We love spa towns too. There is always something of the Jane Austen about them we think and the pace of life always seems to be rather more gentle. The Abbey at Tihany is open to the public and is well worth a visit. A magical situation high above the lake and beautifully restored. We are delighted to see that you have started up another blog and shall be looking in on you for sure! Talk about the waning summer...what a melancholy post! Beautiful, though! I am glad that you caught your train to wing you into the warmth and coziness of autumn and winter climes! We are so pleased that you enjoyed reading this. It was written in a wistful spirit with summer coming to an end and the poignancy of the aged mother and daughter. It seems so long ago now as winter has taken its grip in Budapest.